Pictured in happier, running days. Hello! I’m in search of any technical advice, suggestions, or tips for old two-stroke enduros. 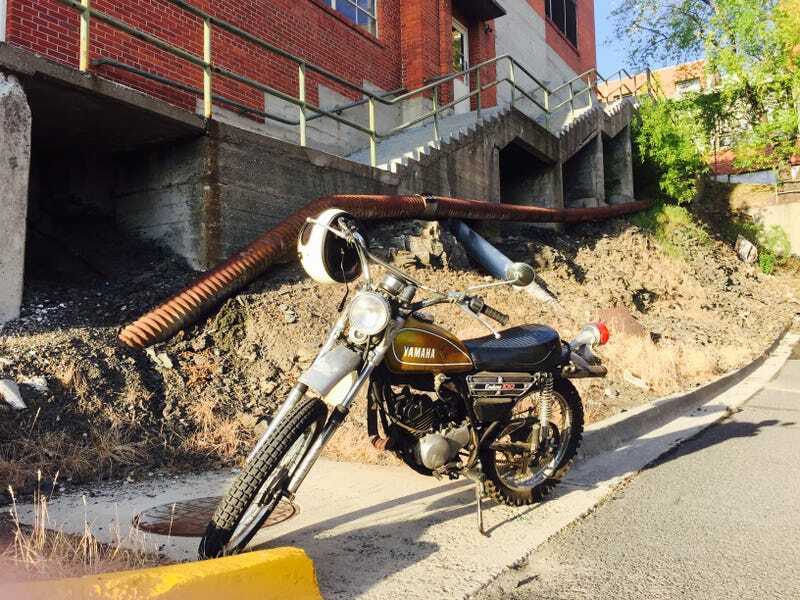 I have a 1974 Yamaha DT100A that hasn’t been running for the last six months and I’m looking to start working on it myself to a) regain a form of in-town transportation and b) stop feeling guilty every time I see it in the parking lot. This is very much a long-term project since I don’t depend on the bike for commuting, just as a bit of fun on the side. The rear locked up while riding at speed, about 50 MPH, and I skidded to a stop. I heard a squeaking noise right before the incident, then BAM - the rear wheel froze. There was difficulty disengaging the clutch and shifting gears immediately after, but I could start it up and putter along in first with no squeaking. Changing up to second locked the rear immediately, so I have a feeling it’s a gearbox issue. The kickstart can move even though the clutch is engaged. Before you ask, I signed up for the forum at www.yamaha-enduros.com to seek some advice from people that know their stuff, as well as to gain access to some technical documents and manuals. I have a couple manuals for the bike, as well as some bike - and engine-savvy friends willing to help. If any of you have any tips or tricks, please feel free to share! I would appreciate it very much.